Show your passion and support for the Landers when you pull on this adidas Highlanders 2019 Super Rugby Woven Training Shorts in Collegiate Navy. The name Highlanders was chosen after the early Scottish settlers in the lower South Island. These Scottish settlers were the founders of Dunedin—known as the "Edinburgh of the South", and the city where the Highlanders are based. According to the Highlanders official website: " The name and image of the Highlander conjure up visions of fierce independence, pride in one's roots, loyalty, strength, kinship, honesty, and hard work." The colours of the Highlanders formerly encompassed the provincial colours of North Otago, Otago, and Southland; yellow, blue and maroon. Blue is also the predominant colour of the Flag of Scotland. These shorts feature sweat-wicking fabric keeps you dry when you're working your hardest in a game. 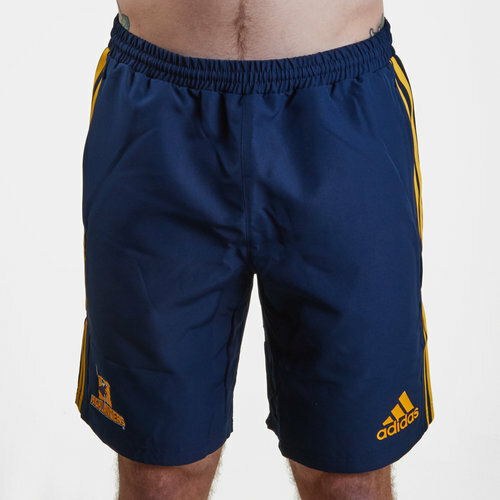 They are navy with the adidas classic 3 stripe motif on the sides of the shorts in yellow. The club badge is on the right whilst the adidas logo is on the left.